We hear our “Old Fashioned Christmas” event at Helmcken House has been missed this year, as the house is closed while we make improvements to the fire suppression system and security. 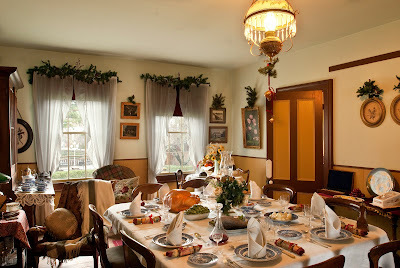 The dining room table at Helmcken House, set for a Christmas feast. Every year, Helmcken House has been decked with Victorian decorations, and for visitors touring it, there has always been a holiday craft to try. I was thinking that now that you’ve had a chance to play with all your new toys, why not pick up the scissors and try making one of your own? When people had a hankering for animated fun in the Victorian age, one of their choices was a Thaumatrope or “Wonder Turner”. The Thaumatrope takes two images and blends them together using the principle of persistence of vision. Give it a try by following the simple steps below. A hole punch (or you can use your scissors if you are really careful). Print the house image and the Santa image on a piece of regular paper. *(If you don’t have a printer, try drawing your own – see the suggestions below). If you tried it – let me know how it worked. If you came up with your own neat design, share it here.